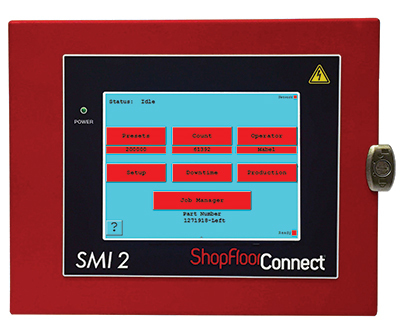 Wintriss will demonstrate a new ShopFloorConnect Machine Interface (SMI 2) terminal, which automatically collects machine status and parts counts, which it sends to the ShopFloorConnect server. The SMI 2 can accept input from barcode scanners for job and operator identification, and communicates to the ShopFloorConnect server over a wireless network. ShopFloorConnect OEE and downtime-tracking software displays the status of all machines on a PC or mobile device, in real time. It automatically delivers production reports (including OEE), while providing live access to data for ERP and MES systems. Also on display: a new servo-press-specific version of the firm’s flagship SmartPac 2 automation controller, called the SmartPac 2 Servo. It can self-learn upper and lower limits for as many as 10 stages of motion per cycle for each tool, and has built-in selectable motion profiles to optimize the timing for all types of servo-press motion. In multi-stage applications where die-protection sensors and timing signals are not required on every stage of motion, the SmartPac 2 Servo can selectively apply these settings only when they’re required.